The beautiful alpine valley of Werfenweng is the perfect setting for romantic, horse-drawn sleigh rides. Both smaller and larger groups can be picked up from the Deublerheim. 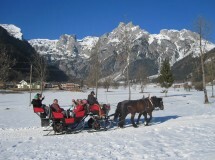 The sleigh ride tours over the snow-covered fields to the end of the Wengerandal, where visitors can grab a bite to eat at the Gamsblick or Wenghof Lodges.